Well, it’s finally happened. We have eggs. It’s like Christmas morning every day. 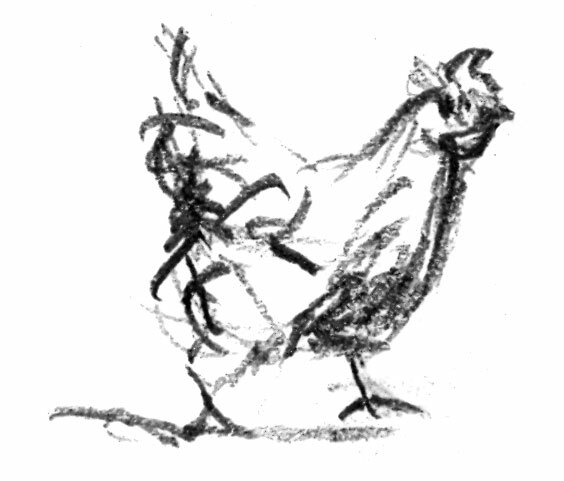 Philamenia, Lucille and Stormy are such good chickens. 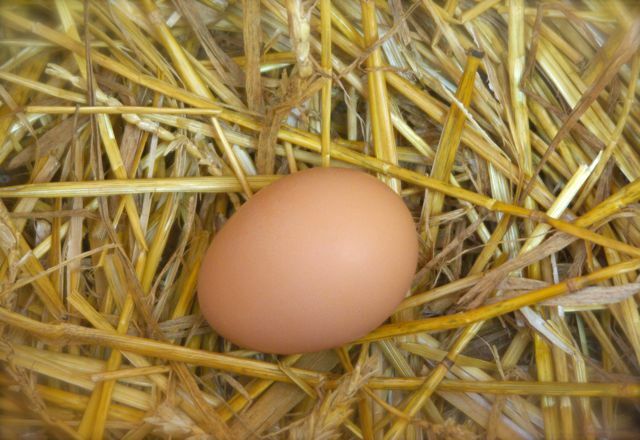 I swear Lucille comes to the door to tell me to check the box if she is out and goes back in the coop to lay her egg. On a different note… Countess Cluck is now apparently Captain Cluck and looking for a good home. As it turns out, having chickens is BETTER than I imagined- and we don’t even have eggs yet! 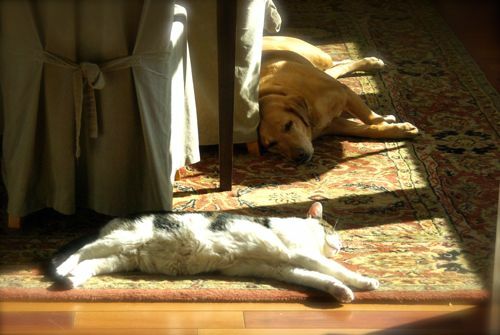 Have you ever seen a chicken chase a butterfly, “ride” a bicycle or sneak up on a sleeping dog? They are so funny, curious and all henny-pennyish. 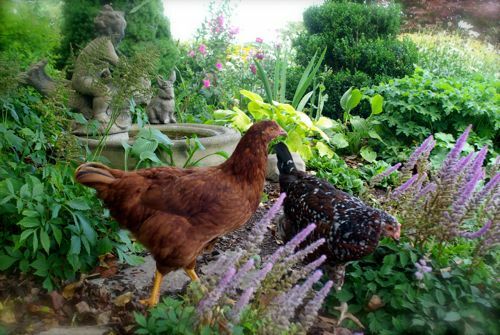 From their cardboard box brooder to their fancy Amish-made coop they have grown and flourished! Whew. There is something so relaxing and pastoral about seeing them out pecking about, perhaps like watching a lazy cat napping in a sunbeam. It makes me stop, hesitate and acknowledge the simple beauty of daily life. They are officially free range…. and super nosey. If there is an open door they will go through it and we are concerned that they may be conspiring to get into the house. Although we purchased electric mesh poultry fencing, we never electrified it. 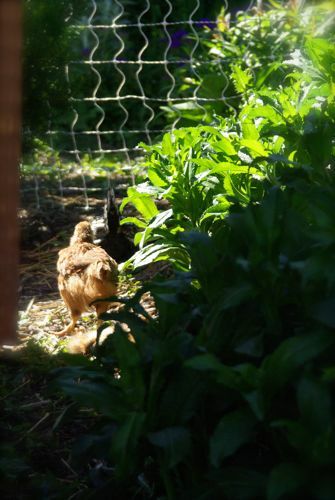 (I wasn’t quite sure if we were keeping the chickens in or the predators out with the electric fencing.) When they were little they wiggled through the square mesh. Now they are too plump to get through even with a running start. 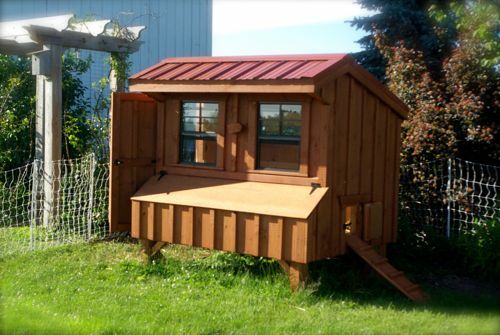 Thankfully we haven’t seen any predators during the day and the coop is built like Fort Knox so I rest easy at night. The girls head right up the ramp by dusk and I play them like a harp (with petting) when they are sitting with their backs to me on their roost. It’s funny and bizarre and (confession) I can’t keep my hands off of them. We have a lovely variety. 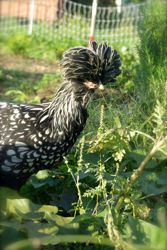 Stormy– The Polish Hen. Her plume has grown so big that she can’t see a thing and is always getting left behind. She’s reminds us all of Cher in one of her Bob Mackie get ups. 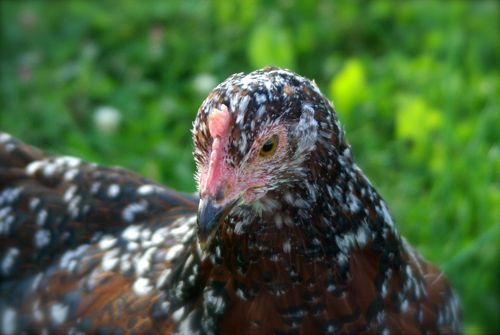 Then there is Dawn Stripe– a Speckled Sussex- brave, yet friendly. 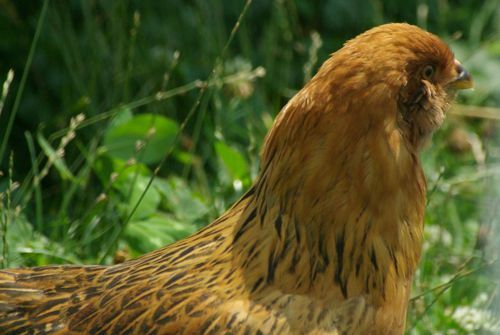 Lucille– the Rhode Island Red- friendly, curious. She likes to peck at my rings and bracelets. Noodles– Ameraucana- a beautiful bird! Prettier every day. She lays Easter eggs… blue and green. Oh joy. 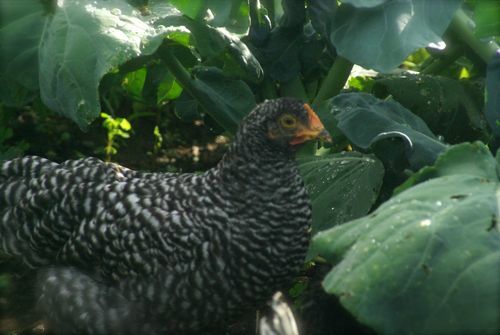 Philomena– Plymouth Barred Rock. Love her. She is the biggest, fluffiest and the most curious. She always is the first to come over and say hello and she loves to be hand fed clover. 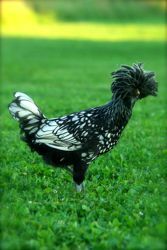 Last but not least is Countess Cluck– a Silkie. She is the runt of the group and squirts through the fence with the greatest of ease. She is still a little puff ball compared to the others. Those presumptuous birds think that the potager was planted just for them. They speed up and down the garden paths, rarely vearing into planted beds- much to my relief. 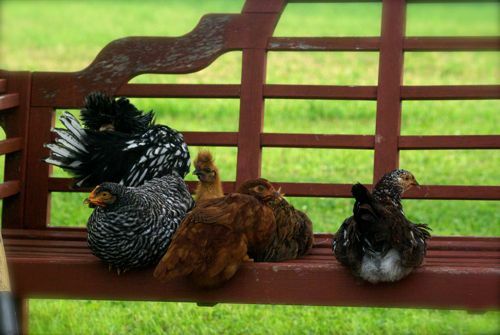 While sitting on the garden bench, they quietly coo and preen like ladies gossiping at lunch. Can you tell that I find them enchanting? If they had started pecking my tomatoes however, the spell… would be broken. We are saving our egg cartons for the big day! Soon the nesting boxes will be open for business. Maybe we will even sell eggs in our new CRAZY wonderful gypsy farmstand!! Did you see how that got started??? Putting the finishing touches on it soon to be put away for the winter. Next Spring say hello to the HEDGES & HARES farm stand on Old Seneca Turnpike! For showing him this video…. That’s how it all started this Spring… only 5 years in the making. 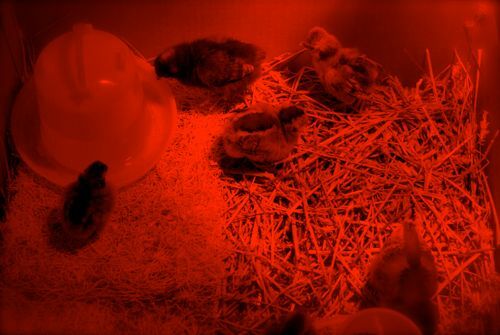 Note to self… never take an excited 9 year old to a hatchery to “look” at chicks with the possibility of buying. I was so swept up in the moment that we were picking out breeds like ice cream toppings at Baskin Robbins. Our little flock of 6 is a motley crew. We even have a rocker named Stormy who reminds me alot of Cher in one of her Bob Mackie ensembles! On the way home from Nature Berry Farm (a hatchery outside of Rochester) I had a mild breakdown… you know the kind. OMG what have I done??? There are peeping animals in the backseat and this is going to change our lives forever. We are now (gasp) “chicken-owners” and they didn’t give me any kind of manual or pamphlet of 12 steps to great egg-laying chickens, or even a chicken coloring book for that matter! 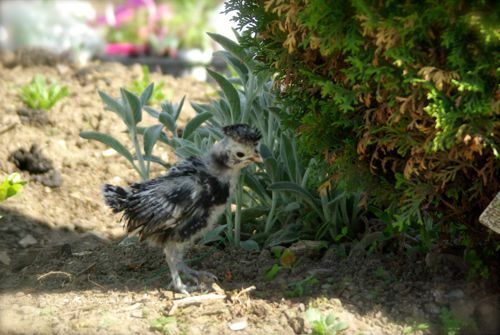 Heaven help us… what do I know about raising chickens? I’ve never been around birds all that much except enjoying them at the bird feeder. We once cared for a friend’s cockatill that always asked “can I come out?”. That being said I do recall sitting perfectly still beneath a gumball tree in MS. for countless hours in a lawn chair with bread sprinkled all around me as well as piled up in my hands. There were birds everywhere. Now that I think about it… I was Crazy Bird Girl. I think I remember being asked to play football and declining because I had “better things to do” like sit in a lawn chair beneath a tree perfectly still for hours. What were my parents thinking? What were the neighbors thinking? What exactly was I thinking? And then there was the time I was sitting peacefully on a chaise lounge on my grandmother’s porch petting a cat when a bird flew across the lawn and landed on my shoulder. Before I could register that a bird flew across the lawn and landed on my shoulder the cat jumped up, grabbed the bird and ran off with it. What!? Huh?! Seriously?! But, but, but… what just happened?! Sigh. There you go. Serendipity or something. On a side note… It’s been a challenge trying to blog about all that has been going on around here this summer! It’s too much! My kind husband/editor gave me some insight and I will soon release a barrage of post that have been nicely broken up and organized.